Frosted Cranberry is not a new scent from Bath & Body Works but it’s a candle I always seem to overlook every year it makes a comeback. This year I couldn’t resist with it’s cute pink Christmas labeling. Yes, aesthetics plays a huge role in my shopping habits… what can I say? I love sparkly candles. Iced Cranberries, Blonde Woods, Red Apple, Tonka Bean. Mmmm!! Smelling the wax, I detected cranberries, a hint of something woodsy and tonka the most. It smelled fresh and wonderful. Just based off cold sniff, I’m already happy! Now let’s see how this candle performs!! I lit my Frosted Cranberry candle in my master bedroom and I’m so happy to report, it didn’t take long before the fragrance was moving through my bedroom. The aroma stayed pretty true… a fresh cranberry with lots of sugar and a hint of vanilla. Interestingly, up close to the candle, I could smell the Blonde Woods and Red Apple pretty clearly but once away from the candle and just smelling the air in the room, I mostly smelled cranberry and sugar with vanilla. The aroma was sweet with the perfect touch of zest. It kind of reminded me of red currant, it was that kind of fresh. Strength – I would rate Frosted Cranberry an 8 out of 10 in a really large room, which is decent. 10 in a medium and smaller rooms. This candle was strong but not overpowering. How did my Frosted Cranberry candle burn? This candle burned perfect. No wick issues. In fact, I actually had to trim the wicks a few times which is pretty rare with this brand. Clean burning from beginning to end. 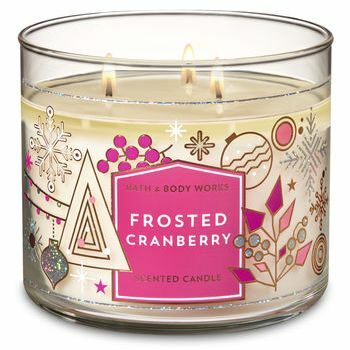 Frosted Cranberry was a delightful winter fruity scent and now that I’ve burned it, I can see why this is a staple winter scent at Bath & Body Works. It’s not your average holiday scent and a great fragrance to burn when you’re tired of all the spice and everything nice. 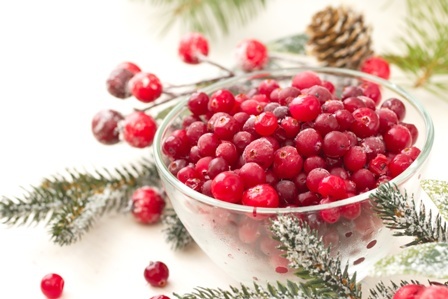 I highly recommend Frosted Cranberry this holiday season.